Around 7 distinct indigenous groups of people live in the Gran Chaco, including the Wichi people. Some of the people have no direct contact with the outside world. Temperatures in the Northern Chaco can reach over 50°. 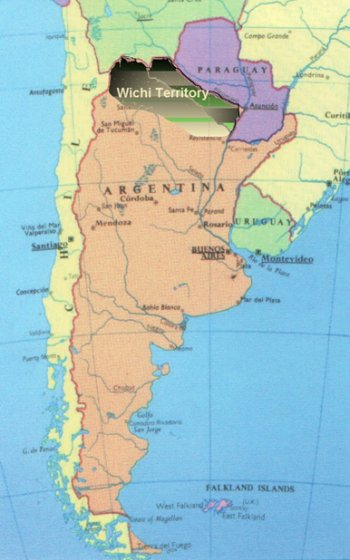 53% of the Gran Chaco is inside Argentina. 90% of all Chaco residents live in the Argentina Chaco. The word Chaco comes from the Quechua Indian word for ‘Hunting Land’ because it is rich in wildlife. The Gran Chaco has the largest dry forest in South America. The Chaco is home to many wild animals including pumas, tapirs, rheas, and giant armadillos. In rural areas of the Chaco there is approximately one inhabitant per square km. In the Chaco there are 400 plant species and 12 animal species that are not found anywhere else in the world. For more about the Gran Chaco see this Wikipedia page. Since the arrival in 1910 0f British missionaries to help and support the Wichi in their struggle to continue living on their traditional lands, many Wichi have become Christians and now form part of the large Anglican Diocese of Northern Argentina. See book ‘Under an Algarrobo Tree’ for more information. Until the 1960s, medical and educational care was provided by missionaries with very little change in the basic sustenance of the people, through hunting, fishing and gathering forest fruits, with occasional seasonal work in the huge sugar-cane estates to the south of their area. Siwok Crafts has a link with Asociana, the Anglican Church social programme of the Diocese of Northern Argentina. Asociana deals with the question of land rights for the Indian communities and with health issues, marketing of honey, literacy, educational matters and community development.